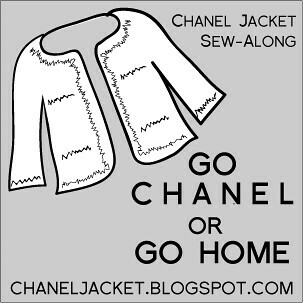 Thanks so much for your super-supportive comments on the Chanel knock-off dress! It means a whole lot coming from you talented, creative sewists and stylists. I am nervous and excited about my first sewing contest and I believe voting opened yesterday. I'll let you know what happens after everything is tallied later this month (I think voting closes on Feb 11). And BTW, happy birthday, Lisa! You have a great eye and I really enjoy your blog. Hope you have a lovely birthday. An exceptional opportunity came up to tag on two leisure days in Miami after a business trip later this month. I'm on it! Now I need some beachwear... some comfy, throw-on-and-know-it-looks-great kind of clothes... preferably some knits. After the many, many men's dress shirt refashions of the last 7 months, I am ready to refashion something new, like t-shirts. To be clear, though: I am not interested in anything that looks deconstructed, no-sew, or obviously DIY. Not shredded, not destroyed, not ironic. All that would be fine at an earlier stage in my life, but I'm not 20 years old anymore and I don't want to dress like I am. I want to refashion some t-shirts into clothes that are unique, stylish, and finished. Something I might see in a store and want to buy. So I'm on the hunt for some inspiration. It's gotta be a quick sew because I'm leaving on the 20th, and I will only whip up a few items. I took a cast-off t-shirt from my hubby's closet and draped it yesterday, using an Urban Outfitters sweater dress from this last winter catalog as inspiration (wish I had a larger photo for you but I snipped this from the catalog and there are no longer images of the dress on the UO site). In my version, the cotton is pretty heavy and there's not much stretch and very little bounce back, but it's a good start. After all, I hadn't put knit fabric under my presser foot in at least 8 months so this is a good start! Here is my "Take One" with a collar that was too high on the neck and too short for the width of the neckline, as evidenced by the bunching around the collar. Also, you can't tell in this photo but there was too much fabric in the back. This is my "Take Two" and final version. I increased the size of the back pleat to eat up some of that fullness, and I opened up the neckline and sort of finished it. I am going to send it through the wash and see how the neckline softens and wears, and if I don't like it I will probably re-finish the neckline some other way. Truthfully, it is so comfortable as it is and semi-flattering on. I want to mess with this basic style a bit more, with a deeper neckline using a lighter t-shirt with some lycra. Have you seen any t-shirt refashions you'd recommend given my persnickitiness? I voted three times today. First vote of the day: a levy. Second vote: a clever refashion of a man's shirt. And third: again on the man's shirt b/c I wasn't sure if I had clicked right the first time [sigh]. vote counted! I really like your little chanel knock off... can't wait to see what else you do with t-shirts. This is so darn cute. Seriously. Love it. For inspiration, you may want to check out Alabama Chanin: http://www.alabamachanin.com/home All of their designs begin with old cotton T-shirts, but you'd never know it. Very nice! And I looked through my Wists and realized I don't actually have too many T-shirt recons there-- also not really into the safety-pinned DIY teenage look. (Though I will admit I do like the reverse applique thing.) I did make a pretty cute shrug out of a T-shirt once, but it was a fitted tee to start with (just too short.) You could probably find some nice ideas at Anthropologie, though. Antoinette, you've inspired me to get sewing again!!! and to look at knit t-shirts in another way. I hope to hit the machine this weekend!! I so agree with you on the t-shirt reconstructions for the 20-year-olds! I'm very new to clothing recon, so will be keeping an eye on what you come up with. You are just sewing up a storm, aren't you? I might try this one. I can do a draft one from all the free advertising t-shirts I have. I have a clothing post coming up soon...yes, I did some sewing! Thanks again for the b-day wishes, you are so sweet! First off, all of your work is so beautiful. You have so much talent! I was looking back at some recent posts and I loooove the Chanel knock-off dress you did. I looked at the pattern review that you linked and saw that you were planning to do a tutorial for that..I would be sooo happy if you did that!! ok, so I've been thinking about this and I have some suggestions: but remember that I don't really sew clothes that much. -I can tell you that if you want something totally different, cutting up one side and opening it out flat gives you a LOT of fabric, especially if you have an xxl shirt. The t-shirt dress is awesome. Question though . . how tall r u? I'm 5'9" and think this may be too "20's" for me unless I started with a XXL for the length. Just wondering. Thanks, everyone, for your comments and helpful suggestions, both for inspiration and for specific projects. I'm checking them out and draping and waiting for the Light Bulb Moment. I love it, and it's much more doable for me that button-down shirt refashions. Was it difficult sewing a knit? Oh, and I've just tagged you to do a very fun tag. Really, if you don't believe me, let me just say that Winona of Daddy Likey invented it. Come over to read about it! Wow,this is a great restyle! I'm glad I found your blog. Love this shirt. I actually like the gathers around the neckline in the front. Is there anyway to do that on purpose and still have it fit? I also have followed your blog as I'm working on some recons for myself. I'm in my mid 20's and agree the slashed look is cute but not really what I am going for.